As we await the coming revision of the NAB Old Testament and Psalms, of which I have heard from a source may take a little bit longer than expected, I decided to look at a very fine edition of the NAB which I recently discovered at a local Catholic bookstore. For those of you who regularly use the Oxford RSV-CE Readers Edition, there is an instant feeling of familiarity to the design, smith-sewn cover binding, and page layout between the RSV and NAB versions. Outside of the fact that the NAB has bolded paragraph headings, the overall look of the two are exactly the same. Yet, with these similarities, the NAB is clearly the better edition of the two. The version I purchased is the tan Pacific Duvelle edition, although you can get it in genuine leather as well. Both are thumb-indexed. *6 X 9 inches,Thumb Indexed, 1514 Gilded Page Edges. *Presentation pages at the beginning for personalizing the book as a gift. *The Dogmatic Constitution on Divine Revelation (Dei Verbum), the Vatican II document explaining how God reveals Himself in the Scriptures and detailing their role in the life of the Church today. *A unique, eight-page section on Prayers and Devotions of the Catholic Faith. *Essay on using the Lectionary, including Sunday and Daily Mass readings. As I mentioned above, this edition of the NAB is superior to their RSV offering. Why? Well, it includes considerably more features than the rather bare-bones RSV. 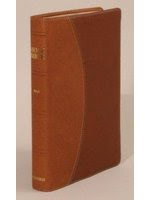 While they both contain the same table of weights and measures, Dei Verbum, and the section on prayer and devotions, the NAB edition has the section on prayers and devotions placed at the beginning of the Bible on glossy paper. I personally like the placement of the prayers at the front, as well as the overall upgrade in presentation. Two other additions help the NAB edition stand out against the RSV version. The first being the inclusion of a 100 page concise concordance. It is always handy to have one of those included, particularly if you plan to use this as your daily Bible. The second addition is the inclusion of the essay by Eileen Schuller "The Bible in the Lectionary" and both the weekday and Sunday Mass readings. If I am not mistaken the essay by Schuller is the one that is included in Oxford's The Catholic Study Bible edited by Fr. Donald Senior. It's a really nice overview of the history of the Church' lectionary, including the foundational principles for the revised Roman Lectionary after the Second Vatican Council. And of course, the inclusion of the daily and Sunday readings, which should be obligatory in all Catholic Bibles, is indeed very convenient. Oxford's NAB Readers Edition also includes something that I have yet to see in any version of the NAB. Anyone who is familiar with the NAB will notice that the page layout and placement of commentary/cross-references are pretty universal with any edition of the NAB. Of course, they are mandatory with the printing of any edition of the NAB, much like the textual notes of the NRSV are. Well, this is not the case with the Oxford edition. While the NAB introductions are placed at the beginning of each book of the Bible as usual, the commentary notes and cross-references are placed as end notes to each Biblical book. To be honest with you, I actually like this set-up in this edition. It is really the first time I have seen just the NAB text, without all the notes and cross-references at the bottom. It is kind of refreshing. At first I thought that it might be a bit distracting to look up a particular cross-reference or commentary in the end notes, but so far it hasn't been much of an issue. The apparatus makes it pretty easy to find out the information you need pretty quickly. And for those out there, and I know there are a few, who really dislike the NAB commentary notes, this might be the perfect edition for you. Ultimately, the only complaint I have against the NAB, as well as the RSV Oxford Readers Editions is that they don't include a map section. Why not throw a few of the Oxford maps on the back? They did it for the recently released ESV w/ Apocrypha as well as the NRSV Catholic Edition of a few years ago. But overall, I really like this edition of the NAB. In fact, it may be the best one out on the market. I certainly hope that Oxford University Press will publish a similar edition when the revised NAB Old Testament and Psalms are completed....of course with maps included!